I had a dream last Thursday night. I'm at the Game Awards, sitting in the nosebleed section. Gabe Newell takes the stage. The house lights go dim. On the video screen, an Arctic landscape, seen from the first-person perspective. We're looking out over the empty plains into the vastness beyond as the sun sets over a distant horizon. We know it's polygons and textures because, well, this is a video game show, but for a minute I can't help but think this is live-action footage I'm seeing—the graphics are that amazing. Music begins to swell, a dramatic stirring of strings. The view shifts every so slightly to the left, and there it is—the Borealis, the long-abandoned ship that Dr. Mossman discovered in Half-Life 2. The screen goes black as the once silent crowd is now murmuring with charged excitement. 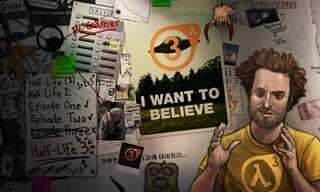 We hear a withdrawn, almost scared, thin voice say, "Rise and shine, Dr. Freeman. It's time to save the world again." There's the deep bass of the Valve theme, and then we see it: the lambda logo, with the number 3 prominently displayed inside of it. The screaming of the crowd wakes me up. Obviously, my dream didn't come true. Another gaming event has come and gone without a Half-Life 3 announcement. We shouldn't be surprised. Gabe Newell has said himself that Valve has moved on to more business-oriented pursuits. I'm not going to say it will never happen, however. The Steam Machines will need a killer app to get them off the ground, and even gamers who have never played the Half-Life series before will likely be intrigued by the mind-blowing awesomeness that is surely to be Half-Life 3. So, it will happen at a time that is to Valve's advantage. Right now, Valve doesn't have anything to gain by announcing Half-Life 3 other than making lots of money by making lots of fans happy. That's great, but what happens when they need an ace-in-the-hole, say when rolling out what is essentially their first home console? It won't get dedicated gamers to buy a Steam Machine because most of us that love Half-Life already have a custom-built PC, but it might help make some people who want the advantages of PC gaming with the convenience of a console take the leap. But what if I'm wrong? What if Valve isn't sitting on Half-Life 3, slowly chugging away at concept art and storyboards until the boss makes it official? What if the Steam Machines launch and it's Left 4 Dead 3 or a brand new IP that causes them to sell like hotcakes? What if the end of Half-Life 2: Episode 2 is the end, and that's the way Valve wants it? SPOILERS FOR HALF-LIFE 2: EPISODE 2 SCATTERED THROUGHOUT. After an adrenaline-pumping battle with a seemingly endless wave of striders that had Freeman ripping across the woods in a dune buggy and launching sticky bombs into the air (how great was that? ), it seems like all is well. The rocket that is mankind's salvation, equipped with the tools necessary to close the Combine's super portal, is up and away. Now, one last run to the helicopter—and in comes the Advisers. Before we know it, Freeman is standing over a distraught Alyx Vance, watching her fitfully cry over her father. There's nothing he, as the character, or you, as the player, can do. There is nothing we can offer Alyx to help ease her pain and grief, no time manipulation to go back a few minutes and save Dr. Vance from his sudden and violent death. There's just an overwhelming sense of loss and pain, and the screen goes black. That's not the way a heroic epic is supposed to end. Ambiguity—like in the first Half-Life—is one thing, but this is your classic unhappy ending playing out right in front of us. There's nothing to interpret, nothing to ponder, no fan theories to resolve any dissatisfaction; at the height of what should have been a victory, our heroes suffer a staggering and terrible loss. Sometimes in fiction, this happens, and when it does, there's a deafening finality to it. Sure, the story may go on in some abstract, literary theory way, but our time with the story, with these characters in this setting, has come to an end. We don't need to know what happens afterward, because the only thing that matters is that the characters fought tooth-and-nail for their victory yet were robbed of something far more precious. Do Gordon Freeman and Alyx Vance find the Borealis? If they do, what of it? What mysteries await on board? Will we see the final revelation that Portal and its sequel take place in the past, with GLaDOS having been the AI operating the Borealis and she spirited the ship away either to find some kind of solace or to hatch an evil plot? I would be okay with that, actually, because it would end with a Freeman vs. GLaDOS boss fight and Mr. Newell, if you're reading this, you can have that one for free. However, none of that matters. What matters is that Alyx has lost her father; Gordon, a mentor and friend. That loss will lay heavy on them for a long time. Their victory came at a high cost. After hours upon hours of being the nigh-invincible action hero (I love Half-Life for many reasons, but not because of its "everyman" hero, because Gordon Freeman is *not* an everyman. ), Eli Vance's death was an unsettling, humbling, and human experience. Sure, it's not as exciting as one more last stand against the Combine, but it's a more poignant and lasting ending than Yet Another Epic Battle would be. I know that at some point Valve decided to at least release one last episode to Half-Life 2, even if we never saw a third full game. They've decided to focus on other things for now, and they may or may not go back to their flagship title that made them offensive amounts of cash. It's their IP, and their right to with it what they wish. Maybe they've examined the landscape of their narrative and decided that the way Episode 2 ends is the way the Half-Life series ends: not with a bang, but a whimper. It's a bold narrative move, if an unsatisfying one. Do I feel that Valve owes the fans some kind of closure? Not in the same way that Activision and Bungie owe fans a bigger and better game than what Destiny was, or Ubisoft and Microsoft owes fans the world and more for the rocky release of Assassin's Creed: Unity and Halo: The Master Chief Collection, respectively, but they kind of do owe us something. Not necessarily a third game, mind you, but at least a straight answer. I'd rather have a "No, sorry, we scrapped it. Onwards and upwards," is better than this constant string of non-committals. It's because of gamers spending their money on the first Half-Life that Valve is the success they are today; even with me late to the party, not having a decent PC until after college, every time a friend decides to dip their toes in PC gaming and I say, "You have *got* to play the Half-Life games," I'm doing my small part in keeping the legacy of that series alive and, by extension, piquing their interest in Valve as a whole. It would be nice to have my patience rewarded or at least acknowledged. But if we never get a conclusion to this series, that won't take away the brilliance of the existing games and we may be better off with a more subdued and human conclusion. After all, if the Half-Life saga ends with Dr. Freeman and Alyx, helpless and grieving, with an even greater mystery out there left to be solved but the defeat of their enemy assured, that feels like a complete and fully-realized ending that plays well in the reputation of Valve exceeding and defying expectations. Image source: The Guardian, "Half-Life 3 — the game that doesn't exist." Rich Stanton. August 14, 2013.